It's worth understanding exactly what's plotted here - in particular for production I am using "all liquids" - ie including biofuels, natural gas liquids, etc. in addition to oil proper. I use EIA data except before 1980 when I use BP data with an extrapolated correction to account for the difference between the BP and EIA all liquids series. I think the use of all liquids is most appropriate here since things like biofuels are being burnt in auto engines and reducing the need for imports, while NGLs do substitute for petroleum demand in things like petrochemicals or using propane instead of heating oil. It also counts as domestic production the refinery gains in US refineries on imported oil: that might be a bit more problematic, but it's not that big a piece of the curve. There are several things worth commenting on in the past data. Firstly, on this all-liquids basis, in the last five years US production has made up most of the ground lost since the peak of US oil production in 1970. That is a pretty significant development. 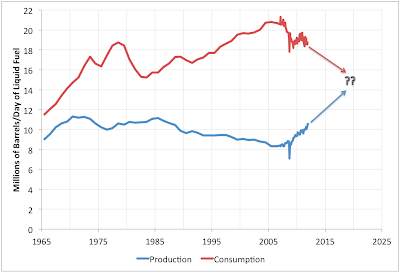 Secondly, the closing of the import gap from about 11-12mbd in 2005-2006 to around 8mbd now has come in roughly equal measures from reduced consumption and increased production. Whether these trends can continue all the way out to energy independence is a very big question. I have shown one possible set of paths that roughly extrapolates recent trends and meets in the middle somewhere around 14-16mbd. I emphasize that this is just an extrapolation to illustrate the kind of thing that would have to happen - I am not making a prediction that this will happen. On the consumption side I don't have much doubt that continued higher and more volatile prices can eventually drive the American public kicking-and-screaming into all driving Priuses and Volts, not heating with oil, etc, etc. It won't be a pretty process and will involve a series of oil shocks and recessions before people get the message, but there's no technical barrier to running the US on 14 or 15mbd of liquid fuel, given a decade or so to get there. I think it's a much larger question whether the recent production increases can continue. Close to 1mbd of the increase is due to corn ethanol and if we try to double that again, the impact on food prices will be truly spectacular. This is noting that we are now using over a third of the corn crop to make this much ethanol, and that cellulose ethanol is still a completely unproven technology as a commercial proposition. Most of the rest of the increase is due to finding oil in tight rocks like the Bakken and using capital -intensive extraction techniques (fracking and horizontal drilling) to get it out. This makes commercial sense at sufficiently high oil prices. The question is how much potential there is to increase such resource plays beyond what has been done so far, but that is a question deserving of future posts all to itself. I've seen others assert that shale gas could be very important. There is supposed to be lots of it. Does that appear in your "all liquids"? Its not technically a liquid, but I'm sure cars running on CH4 is possible. Belette - the methane from shale gas is not counted in "All liquids" but the ethane and higher are counted as natural gas plant liquids (NGLs) - so to the extent the shale gas is wet it does contribute to the liquids stream (yes, I know this is a slightly perverse definition of "liquid" but it's long standing industry parlance). 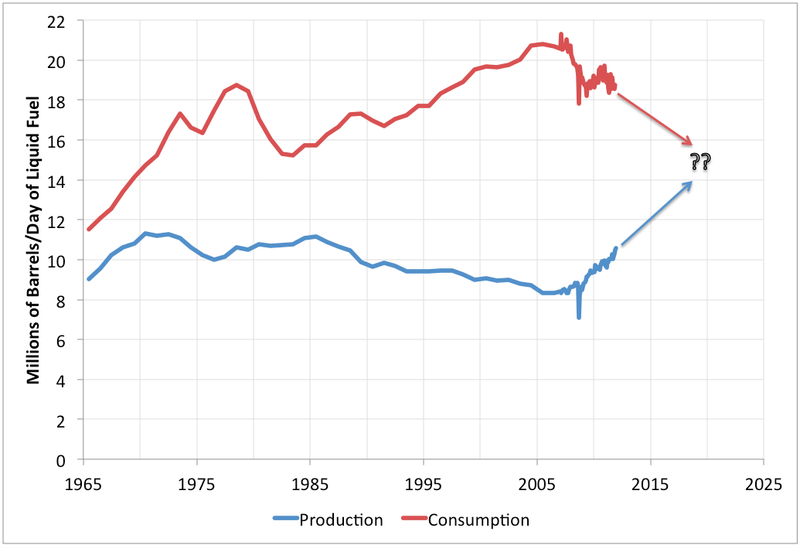 Production of some 2mm barrels of liquids per day above the conventional "easy-oil" peak in 1970 will be a nice trick, as will operating an economy with twice as many people (than in 1965) at 1965 consumption levels. Stating there will be "a few recessions" along the way is perhaps not the most accurate disclaimer. Hey, Stuart. One question: Why does the data get so much more noisy after ~2006? Hal - it's monthly data from 2007 on, annual before that. When you included bio-fuel, did you consider the net energy create by bio-fuel? There is quite bit of diesel, LPgas, and gasoline that goes into bio-fuel production. Don - the net energy of biofuel is very poor but the net liquid fuel is quite good. The great bulk of the energy inputs come from natural gas (for nitrogen fertilizer and process heat for distillation) not liquids. An analysis of the possible reductions in personal transportation fuel consumption seems very straightforward: a 50% reduction is very doable.